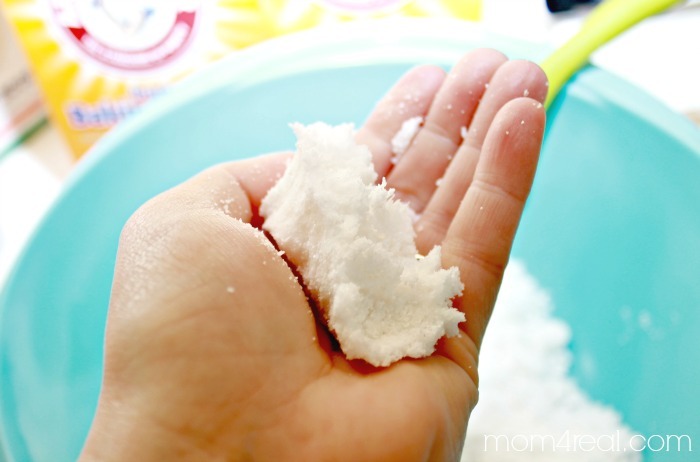 A few months ago, I shared my recipe for Homemade Dishwasher Detergent, and it was a huge hit! A few readers have emailed me or commented asking if I knew how to make homemade dishwasher tabs, and I am happy to report, I finally found an easy way to make your own that actually works! Believe me, I tested a few methods that were not so great. These dish tabs not only do a fabulous job, they smell great too! Mix all of the ingredients together with a whisk except the water. Mix really well, making sure that the oils are mixed well with the dry ingredients. Slowly mix in water, a little bit at a time. I start with about a tablespoon, mix really well, then check the consistancy. Keep adding water until you can form a loose snowball. DO NOT OVER WATER OR THEY WON’T DRY WELL. 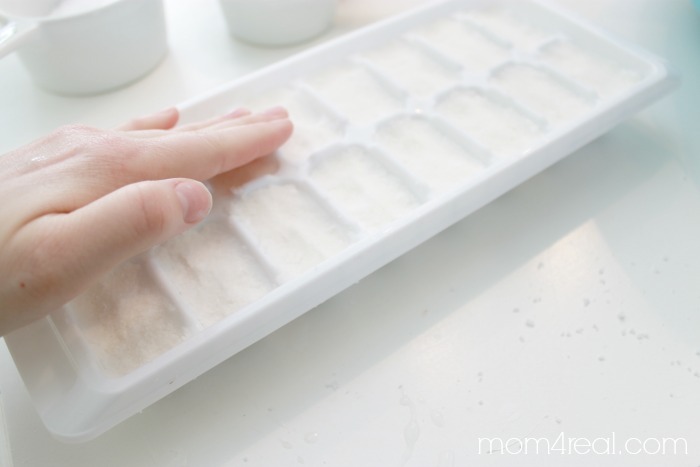 Once your mixture is the right consitancy, fill your ice cube tray, pressing down to be sure there are no air pockets. Let them dry for 12 – 24 hours. Once they are finished, you should be able to lightly turn your tray and they will drop out like ice cubes. 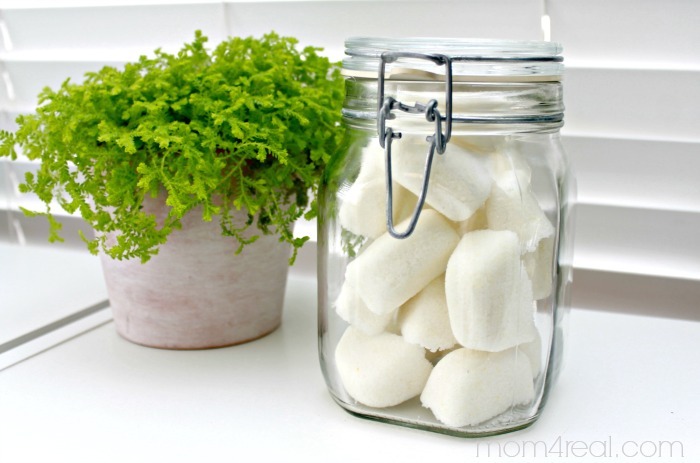 You can store them in a baggie or jar, just be sure they don’t get wet until you are ready to use them! I love that I can now make my own dish tabs…it means I have added yet one more item in our home that isn’t full of unknown chemicals, they smell absolutely amazing and I don’t have to run to the store every time I run out…I can just make more! For more cleaning tips and tricks, like How To Clean In Between The Glass On Your Oven Doors, simply click HERE! I am so going to try this. Might be easier for my son when he is starting the dishwasher for me. I already make my own soap but he has a hard time measuring the right amount. Yay! I so wish I knew how to make my own soap! It’s definitely on my list, Tanya! A packet of unsweetened lemonade mix works GREAT, is very inexpensive, and smells good too! Are the oils just for the scent or do they serve a cleaning purpose? There’s lots of essential oils you could use for different reasons…lemon and orange work well at cleaning, lime helps clean grime, etc. I wanted to ask what is “washing soda” and where would I buy it? Granulated Washing Sods is a water softener. We find it near the laundry powder. It is made of Sodium Carbonate. What an awesome idea! Thanks so much for sharing it, I can’t wait to try this out! How long have you been using these? For close to a month now, Tammy, and I love them…they work just as well as the expensive store bought tabs! I will give this a try! Thanks for sharing! Definitely want to try this! About how much does it cost for one batch of these? What a disaster! I’m so mad I wasted all that money on the oil and all the ingredients! 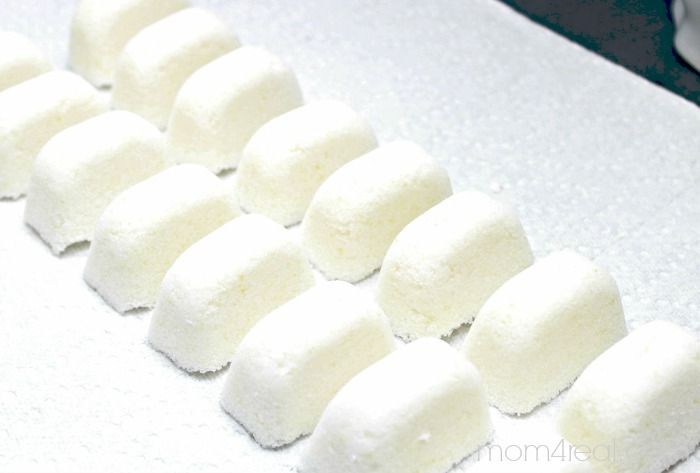 They look like marshmallows and made a huge sticky mess. I only used half the water and made sure to whisk everything. These DID NOT WORK! Love all the photos but don’t love the project. Sorry. I’m so sorry they didn’t work out for you, Amanda. I’m not sure why. I just made another batch over the weekend and they still work for me. Sorry , Amanda! It sounds like maybe you added too much water, I add it nearly drop by drop or even use a spray bottle to moisten the mix with the water. Make sure to mix it with your hands really well in between water drops. (Take your jewelry off while doing this by the way) I have had my share of citric acid fails and it is always from too much moisture. Hope this helps!! great idea! what is that cute little plant next to the container of tabs?? Thanks, Kacey! That is a bird’s nest fern…bought it at Lowe’s! Just wanted to let you know you have a typo.. In the last paragraph, you say “it means I have added yet one more item in our home that is full of unknown chemicals,” and I think you probably meant to say ISN’T full of unknown chemicals ? Now, my question.. does this work in hard water ? Thanks. Thank you, Deb…I am so glad you pointed that out to me! I actually have hard water and they work great for me! Hope it helps! Could I use oxyclean instead of citic acid? Hi, Priscilla! I really don’t know about that…I would be afraid of the chemical reaction. If you make them with it, let me know how it turns out! Is there another name for “washing soda’? I am from New England and don’t know what that is. Can we get the citric acid at a drug store? The problem is the reaction between the citric acid, baking soda, & water. The byproduct of the chemical reaction is oxygen, thus the tablets “rise”. That’s why a previous poster noted they are like marshmallows. I’m hoping I can compact them after they have dried a little bit & the reaction has run its course. Next time, I will leave out the baking soda & try using just the washing soda. The same thing will happen if you use vinegar with the baking soda. I’ve made this before but not in cube trays. It was an exercise in futility. I got 28 cubes from this. One thing I have not seen mentioned, but was very much present in the making…these little cubes rise like bread so keep that in mind. Heck, I wish my bread rose like these little beauties did. I made these last night and they kind of bubbled up into marshmallows, and now the tops can come out but the rest is stuck in the tray. Think I can scoop them out, ball them and still use them!? Thanks! I am not sure what I did wrong! Ooops I mean Ecover dishwashing tablets. I’ve been using these dishwasher tabs for the past two years and love them! Just be sure to follow the recipe or they won’t set right ???? Do you know what the shelf life on these would be? 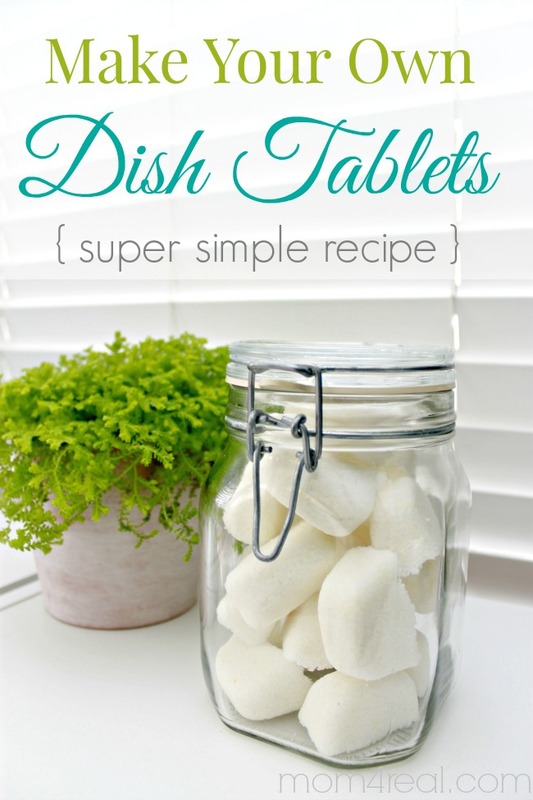 I can’t wait to try making my own dishwasher tabs! You make it look much easier than I would have thought :) Just need to get these ingredients together. after reading all comments, I have a question………do these cubes (that are formed in an ice cube tray) fit in the dishwasher soap holder? I don’t think the cover would fit over these homemade pads. I think they are too tall to fit there. better question, where do you put them in the dishwasher? Thanks! Mine fit just fine, but our door to the dish detergent compartment had been broken for some time, so we always just tossed ours into the dishwasher. You can either do that or make them in smaller mold if that is needed. Hope this helps! I’d like to try this recipe but I don’t have kosher salt. I do have regular table salt. Does the salt HAVE to be kosher? And if so, do you know why? Thanks! Just wondering whether the borax is absolutely required or if the recipe would be successful without it? Just made my second batch of these. They work well. Use the small cup of vinegar in the top rack as suggested. 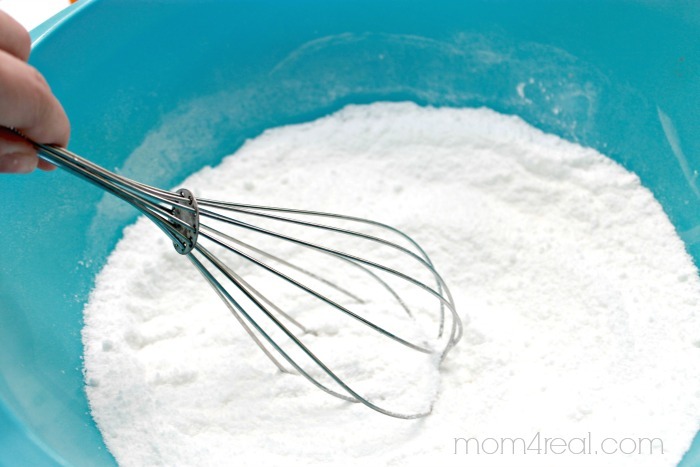 After you mix the ingredients with a whisk use a spray bottle of water and mix with your hand. Just do a spray or 2 at a time until you get the right consistency. Thank you for sharing this recipe! CAN YOU TELL ME WHAT “WASHING SODA’ IS?